There is something wonderfully traditional about making pound cake. Pound cakes are simple to make, tasty, and a great canvas for additional flavor. You can serve it the most simple of ways - with a few strawberries and powdered sugar - or dress it up with chocolate or citrus glazes, fresh fruit coulis or homemade ice cream. This recipe caught my eye because it uses ricotta in the batter. Ricotta is a great way to ensure that a cake stays moist and gives that extra something to such a simple recipe. Using an electric mixer, cream together the butter, ricotta, and sugar until light and fluffy, about 3 minutes. With the machine running, add the eggs 1 at a time. Add the vanilla, orange zest, and Grand Marnier until combined. Add the dry ingredients, a small amount at a time, until just incorporated. Pour the mixture into the prepared pan and bake until a toothpick comes out clean and the cake is beginning to pull away from the sides of the pan, about 45 to 50 minutes. Let the cake cool in the pan for 10 minutes then transfer to a wire rack to cool completely. Using a mesh sieve, dust the cooled cake with powdered sugar. Enjoy! this one is going in the save file. Your pound cake looks fabulous. I just love what the addition of ricotta does for a cake. Man, oh man, how yummy! What a lovely cake - I love the Grand Marnier flavor here! Wow the cake looks so moist and delicous. Wish i had a slice with my afternoon tea. That cake DOES look good, I haven't tried making a pound cake yet though. I wonder, can you substitute anything for the Grand Marnier? Maybe some orange juice. 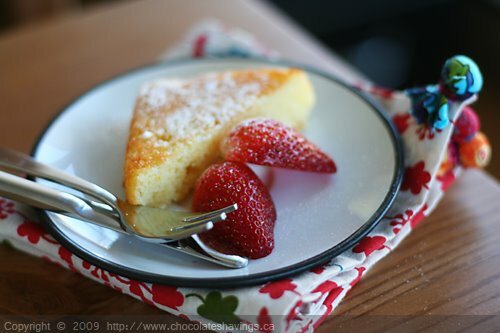 I love pound cakes and are always looking for new ones....I will give this a try...thanks! the cake looks yummy. how do you think it would do w/ the addition of some blueberries? combine well w/ the flavors already going or detract from them? As good as it gets...all my fave things in one...YUM! Beautiful picture too! Gorgeous!! And I do have some extra ricotta laying around that I was going to use for pancakes this weekend... but your cake looks too good! Wow, what a delicious and moist pound cake. Love the orange and use of ricotta. Pretty cake! That looks so light... I love orange cake but have never tried a ricotta one. YUM! Jacquie: I think blueberries would work nicely with the base flavor of the cake. You could serve it with a chunky blackberry coulis and I'm sure it would be delicious. Let me know if you get a change to try it! Beautiful looking cake...so light but very full of flavor. That cake look nice and light and good! I love a simple cake like this one! This looks quite tasty. I couldn't agree more with your statement about ricotta helping to keep things moist. If you have access to homogenized milk I highly recommend making some fresh - there is nothing quite like it (and it is super easy). UN-homogenized milk that is (stupid automatic spell check). I love the way technology has the uncanny ability to magnify the prevalence of my stupidity to completely new heights! ta photo m'as donné envie de le faire ! c'était super bon ... Victoria et Philippe ont adoré ! I've made a pound cake a few times, but only using the "regular" recipe.